Valerian is a great herb for improving our common side effects of the modern life style called “insomnia and stress”. 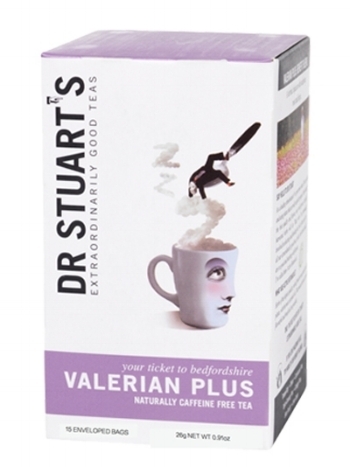 Valerian Tea can also help neurological disorder, gastrointestinal problems, ADHD and seizures and it’s better to drink valerian tea before bedtime. Peppermint is a nutritious herb that can help indigestion and calm stomach disorders. Peppermint tea can also soothe stomach muscles and intestine and improve the inflammatory bowel disease. The powerful phytonutrient in peppermint can also reduce the growth of cancer cells in liver and pancreas. Rooibos Tea originally grown in South Africa is known for its two powerful antioxidants called aspalathin and nothofagin. Green Rooibos Tea is naturally grown caffeine free tea and the powerful antioxidants in Rooibos Tea can fight free radicals and cancer cells. The powerful antioxidants in Rooibos Tea known as Chysoeriol can improve vascular health by enhancing circulation and lowering cholesterol and blood pressure. Ginger tea made from the roots of ginger is an effective herbal tea for treating motion sickness and nausea. This great anti-inflammatory herb also improves digestion and helps to reduce the pain of arthritis, joints and muscles. The powerful antioxidant in ginger tea is great for reducing stress and cleansing chemicals and free radicals accumulated on our bodies. Ginger is also a great herb for fighting cold and reducing menstrual cramps. The active substance in echinacea tea helps to boost the immune system and fight infections. Echinacea Tea is great for improving colds and flues, nasal congestion and infections such as skin, eat and urinary tracts infections. Echinacea Tea is not recommended during pregnancy.